I recently completed an Instagram challenge through Bloggers Get Social and it was one of my biggest blogging/social media accomplishments to date! I mean let’s be honest, besides my daily normal tasks of showering and brushing my teeth, there is not much that I can say that I have stuck to for 31 days straight, besides coffee... I am pretty damn proud of myself to say the least! That being said, here are 5 reasons why you should do an Instagram Challenge NOW! //Gain More Followers- The Instagram Challenge definitely helped me gain more followers! I’ve been using Instagram for a few years now, but I recently decided to make an account for my Blog in November 2015. When I started the challenge, I literally had about 40 followers and by the end I had 135 followers! Obviously I would love to gain more followers on Instagram, but I did make a lot of “friends” and have a few loyal followers now. //Make Friends- It was fun to see what other Instagrammers posted for the challenge on each day and it was fun to “make friends” through the hashtag and challenge. I have gained maybe 5-6 loyal Instagram followers and I even visit their feeds everyday for updates now too! //Forced to Post- I am not a quitter, so on days I didn't feel like posting I MADE myself. I was way to far invested to quit at any point and I'm pretty good at finishing what I start. Committing to the challenge and forcing myself to post a picture everyday helped ensure that people were looking at my feed and remembering my Instagram/Blog name! //Blog More- The Instagram challenge also forced me to Blog more. If the challenge was “post a picture of something delicious”, I wanted to make sure that my viewers saw my Instagram post and then actually had a link (i.e my blog) to find that delicious recipe. //Fun- I seriously had the best time doing the challenge, because it was over Christmas time (my favorite Holiday) and I LOVED coming up with creative ideas for my next photo. Since January is already off to a start, I would recommend thinking about waiting until February to start an Instagram challenge. You can find one by searching Pinterest or following @bloggersgetsocial for their monthly Instagram Challenge! I might be considering hosting one shortly too! Are you following me on Instagram yet!? I love doing them because it MAKES me take pictures and look for inspiration! Agreed! I will definitely do another one soon! 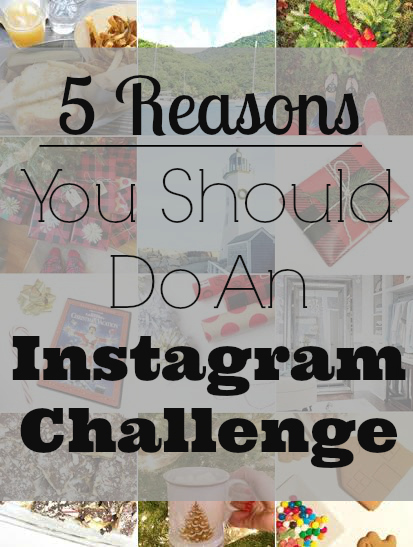 I totally agree with all of your reasons to do an Instagram challenge! I've participated in a few now and not only was it a blast but I felt like it helped me to gain followers and meet other bloggers. The one I participated during Christmas was especially fun because who doesn't love Christmas pictures!